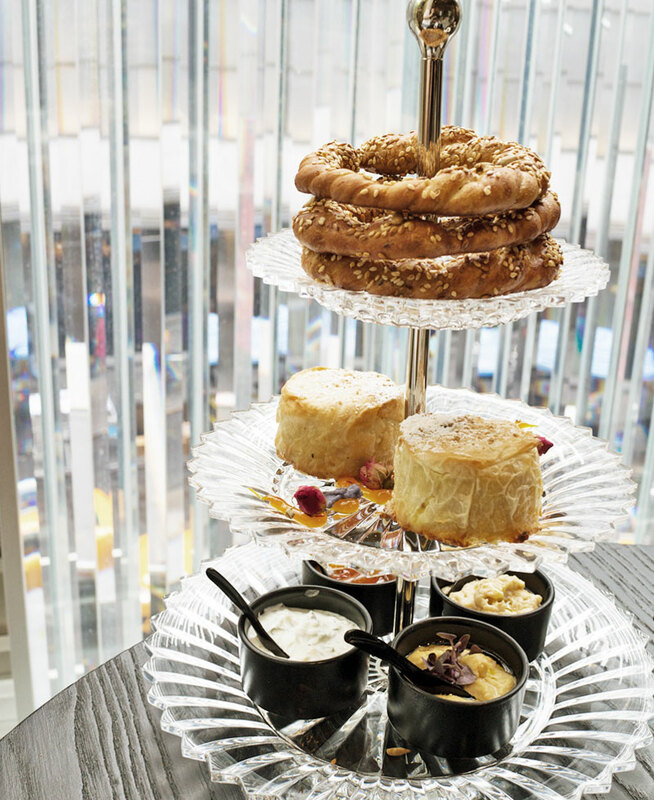 The Baccarat Hotel New York has a very swanky lounge where afternoon tea is served. The Grand Salon is on the second floor of the luxury hotel located right across from Museum of Modern Art. I met up with Alexis for a very special afternoon at the Baccarat for a 3.5 hour Turkish Tea for Two. Everything from the concept to each delicious savory bite to the last sip of tea was all thoughtfully prepared. 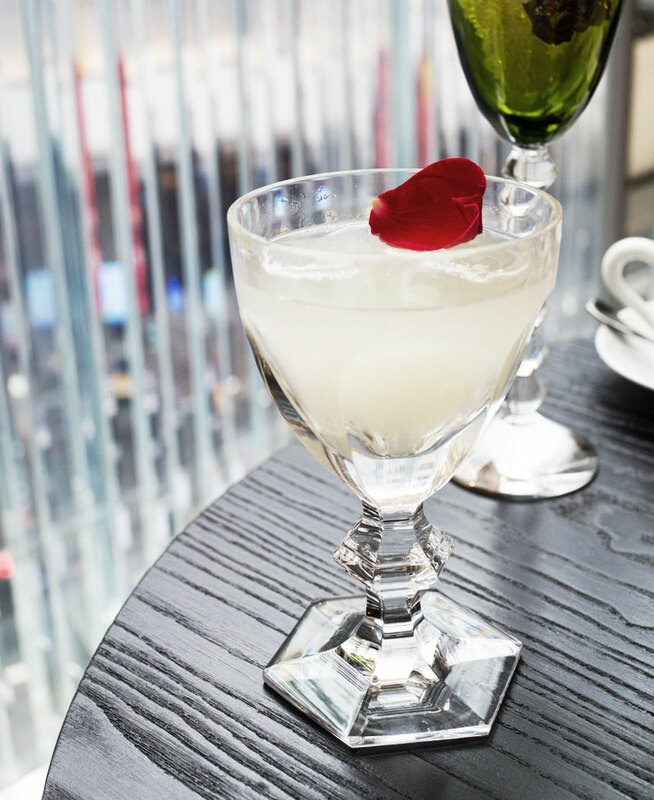 Before the first course of the savories came out, I got a Rosewater Lemonade, pictured above, which was delicate and refreshing. Do I Need to Make a Reservation for the Sultan Abdulaziz at the Baccarat? 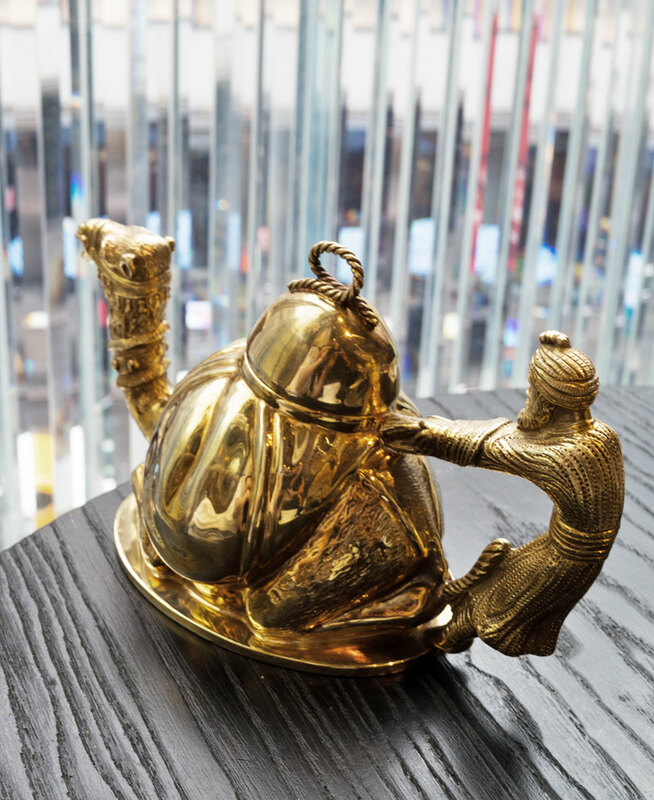 The Sultan Abdulaziz is the Turkish Tea for Two and it’s only served Wednesday – Sunday from 1PM – 4PM. A reservation is required at least 24 hours in advance. 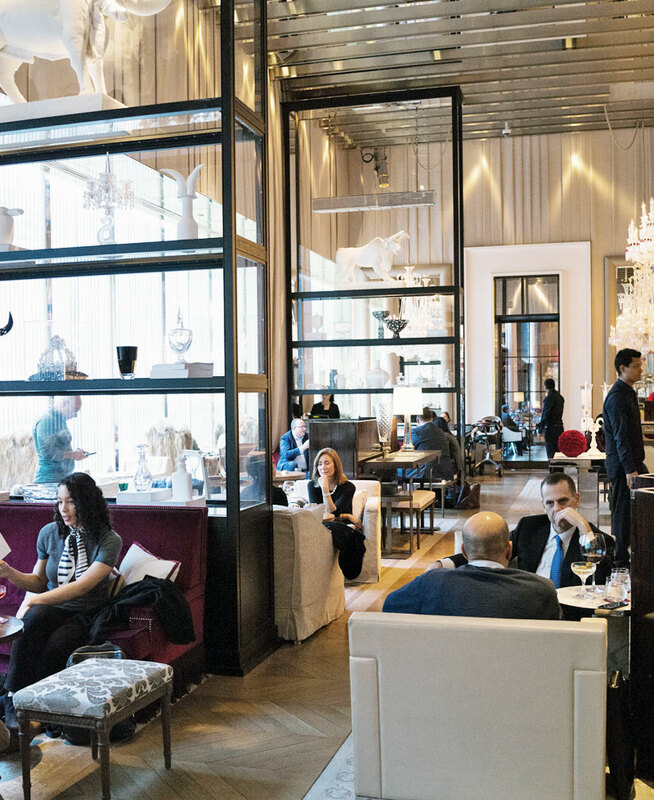 How Does Turkish Tea the Baccarat Work? 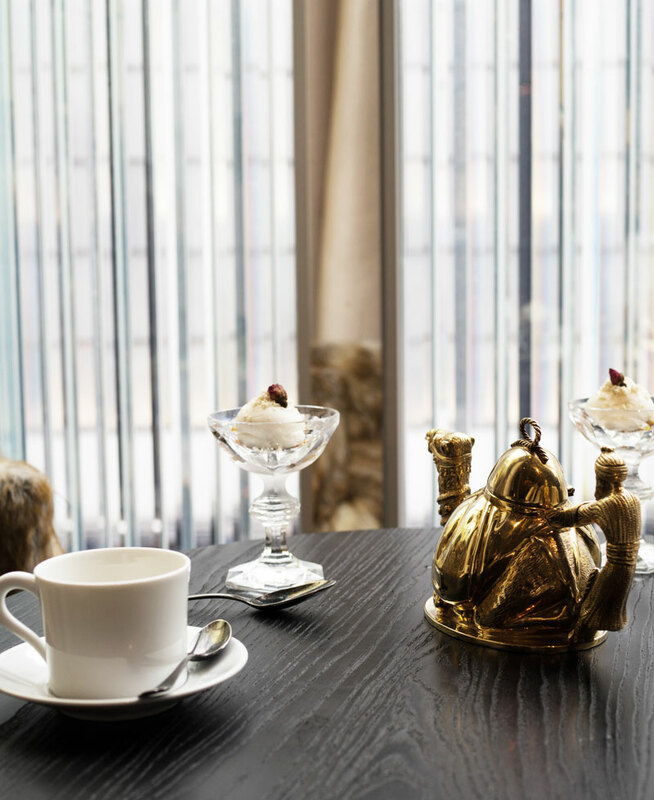 The Sultan Abdulaziz is a set afternoon tea that comes in five courses and tea. You don’t select any of the food — everything listed on the menu is included in the cost. You can select the tea but I like the Dunes du Sahara that comes out in the golden camel teapot so I wouldn’t make another tea choice. 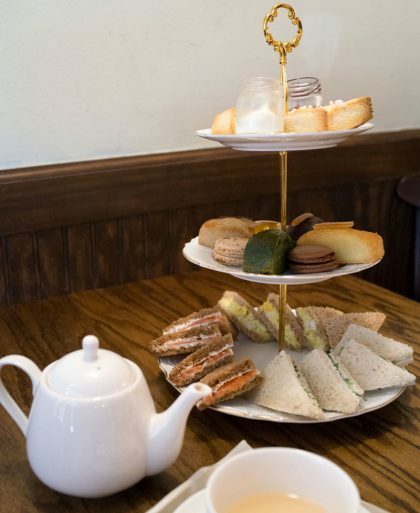 But, if you wish, additional tea selections are listed on the back pages of the menu. 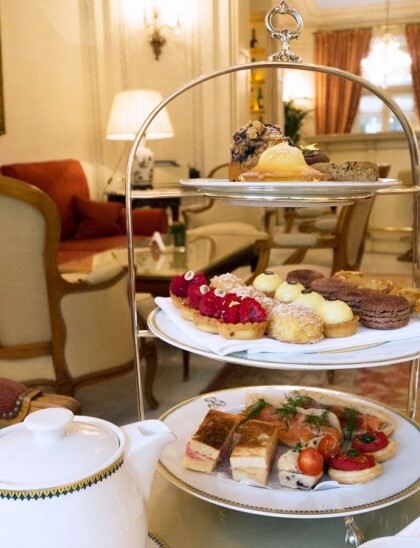 The Grand Salon on the second floor of the hotel is where afternoon tea is served. Dripping with crystals, the room is lavish and laid out with little sitting nooks that feels intimate. The service is perfection. The servers are attentive and warm, making sure we were comfortable and had everything we needed. While I was sipping on the Rosewater Lemonade, the first course came out. 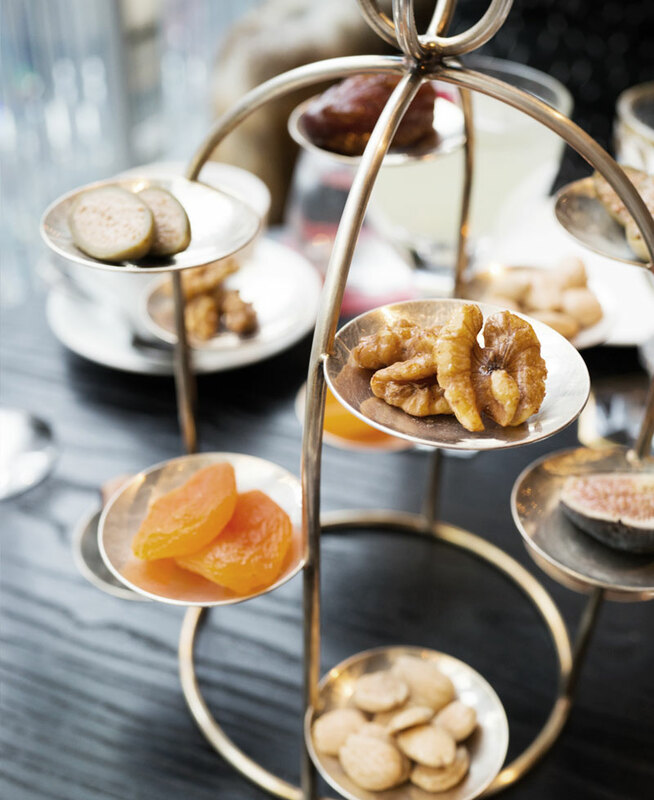 A golden stand with small bites starts out the food part of the tea service. Since the Turkish Tea is meant for two people, there were two of each of the walnuts, almonds, dried apricots, caper berries, dates, and figs. At first, I was worried that the portions would be tiny throughout but alas, I proven wrong as each course got bigger and more filling. The second course was my favorite. 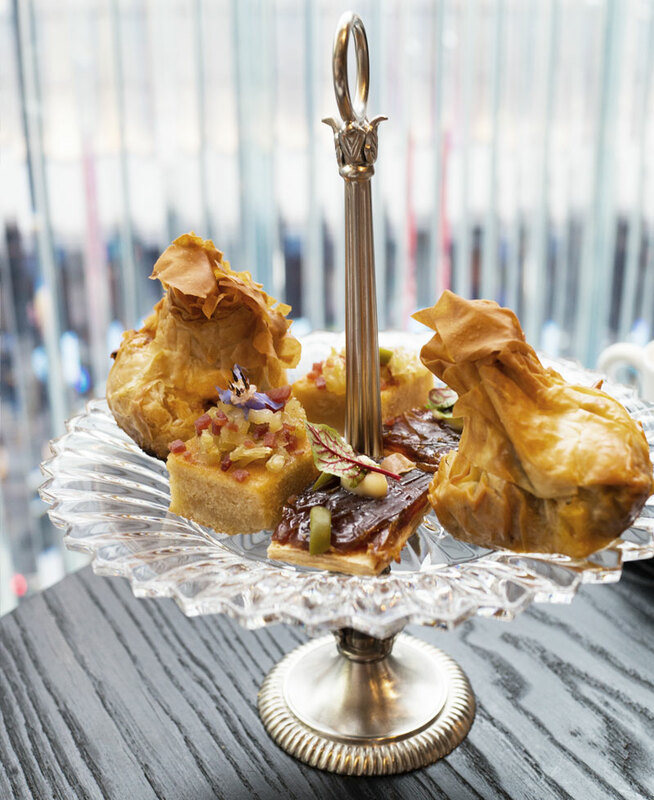 On a one-tier tray were Pistachio Financiers, Date “Bacon” and a Filo Purse filled with lamb and feta cheese. I can write an entire post on the Filo Purse. IT WAS SOOOOO GOOD. The slight heat from the spices were cooled down by the melty feta cheese. The filo dough was so light and crisp, it was a definite highlight. The Filo Purse does require a fork and knife to eat. 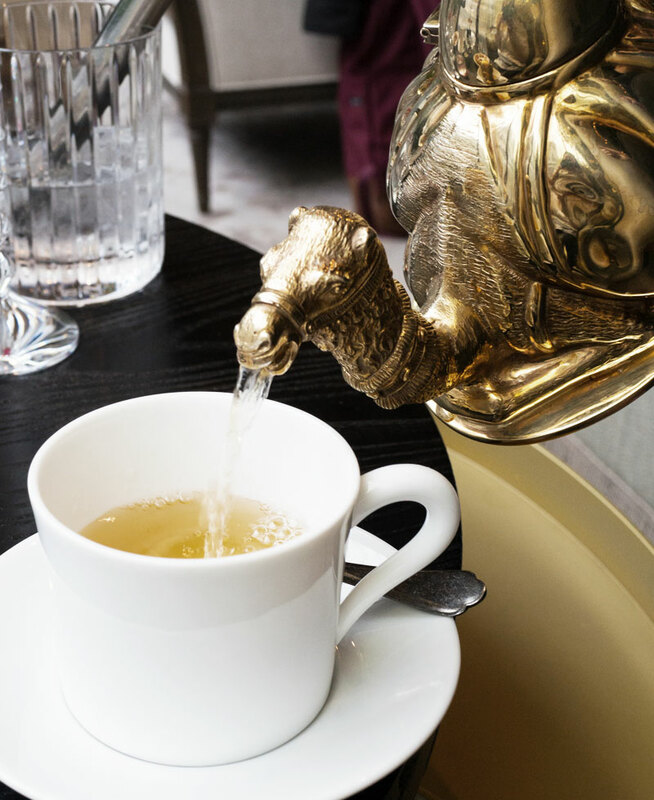 Before we go to the third and final savory course, the tea comes out…in a golden camel teapot. At the last Baccarat review, I gave the tea selection four stars since they only had blends on the menu but since then, that has changed. But I didn’t bother looking at the tea menu too carefully since I knew I wanted to get the recommended Dunes du Sahara, a green tea with fresh mint. The tea itself is steeped in the kitchen so it never gets bitter sitting in the pot and if you take a peek inside the golden teapot, you’ll see fresh mint leaves inside. The tea service is planned out so that you get the tea only for the last savory course. The Baccarat has just four of these teapots and it costs about $2500 each. The third course is the biggest and the last of the savories. On a three-tired tray were, from the top, Sunflower Fennel Simit (also known as a Tukish bagel), Chicken Pastilla, and an assortment of dips. 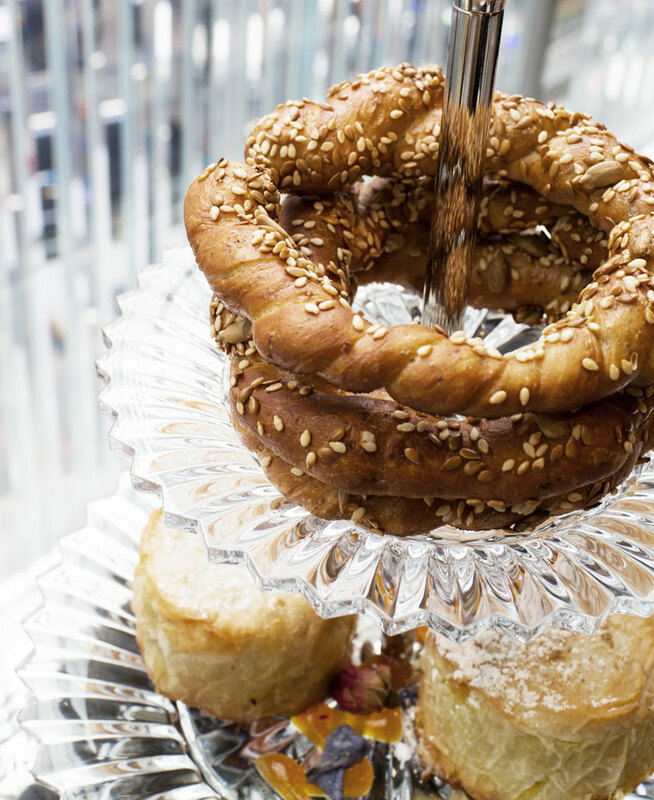 The assortment on the bottom tray are meant to be eaten with the simit and it includes apricot saffron jam, hummus, baba ghanoush (which is always fun to say), and tzatziki. By the time we finished this last course, I was definitely full. But I did have just enough room for something sweet. The last course is a sweet one. 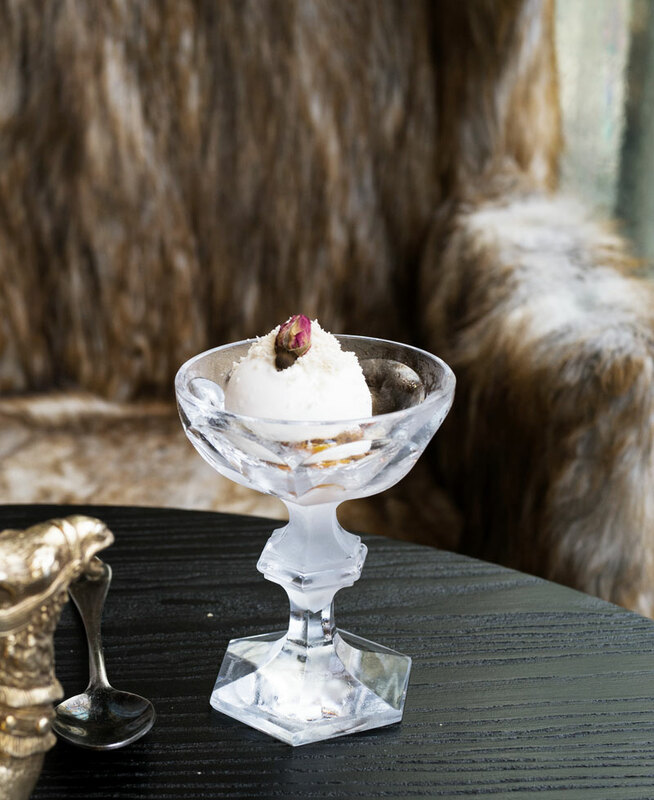 In a chilled crystal goblet is a scoop of frozen labneh, a cream cheese made from yogurt and it’s served with candied kumquats and rose halva. Not too sweet but nice and tangy. The perfect end. The Baccarat is killing it with their afternoon tea service. They’re the best of the best right now and love that they roll out these unique tea services that no one comes close to touching.